I'm happy to share a success story from this summer's Query Kombat. Stellar Twins Kickin' It Cosmic Style (Emergence) was one of my picks with stand out voice! I'm so glad to see it found a home! At first, I was a little wary to share my story. I’ve had a lot of failures, far more bombs than triumphs, but hopefully sharing my stumbles will help others to soar. For those who like stats, here’s a quick breakdown of what it took me to get published. 82 queries sent (5 variations of the letter with 4 different openings) gaining 1 partial request, ending in rejection. 4 Twitter contests entered, no wins. Majority of agent feedback– all tell no show. 62 queries sent (3 variations of the letter with 4 different openings) gaining 1 full and 3 partial requests, ending in rejection. 3 Twitter contests entered, 2 wins (both by lottery) with 1 full and 1 partial request, ending in rejection. Majority of agent feedback– too stiff, no voice. 22 queries sent, 0 requests. 2 Twitter contests entered and 2 wins gaining 6 full and 1 partial request, ending in rejection. Majority of agent feedback– not connecting with the tone. 4 submissions to independent presses and 1 Twitter publishers pitching event, 7 full requests, 5 offers of publication, and 1 offer accepted. As you can see, it has been a long road. When I think back, I can clearly see the noob mistakes that garnered me so many rejections. With my first script, I queried before I was ready. I didn’t take the time to properly research the craft of writing, which led to infodumps, backstory, unnecessary dialog tags, and just a mess of a manuscript. When I wrote my second novel, I was so focused on getting the technique right that I forgot to add a flare to my writer’s voice. The story's concept got me a few requests but ultimately the narrative fell flat, making it difficult for the reader to become immersed. At this point, I was ready to give up. Why was I driving myself crazy, neglecting my friends, family, the DVR if I’d never make it? I shut down my laptop, for a whole day. It was the longest day of my life. That's when I discovered there was no turning back, I was addicted to writing and an awesome song came on my Pandora (you know how that goes). So I went in a different direction with my third story, I took risks. I let my voice spew out, no holding back, and loosened up my style. Much to my overwhelming joy, I ended up with a buffy-esque flow. Unfortunately, that wasn’t what agents were looking for at the time but publishers loved my fun, youthful approach. Just goes to show you how subjective this business really can be. The best advice I can give anyone who is striving to achieve anything significant in their life is to never stop improving. Always push your limits until you’ve reached the shiniest you possible, then push harder. Take advantage of the awesome opportunities available within the Twitter #amwriting community. I met my incredible CP’s through Twitter contests, they’re a constant source of inspiration and I get to share in their achievements. Every contest host, judge, and many of the slushies have blogs dedicated to educating writers in every aspect of the business. Learn from their years of experience because if it wasn’t for their generous guidance, I would have never gotten a publishing deal from Month9Books. 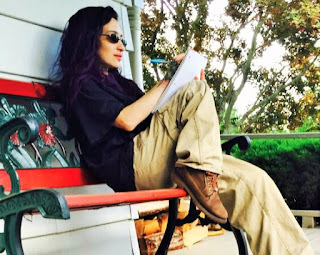 Jamie Zakian is a fulltime writer who consumes the written word as equally as oxygen. Living in South Jersey with her husband and rowdy family, she enjoys farming, archery, and blazing new trails on her 4wd quad, when not writing of course. She aspires to one day write at least one novel in every genre of fiction. Her debut YA sci-fi thriller is forthcoming from Month9Books. Congratulations, Jamie! A long road indeed, but so worth it. May your books be a great success! Congrats, Jamie! Month9 looks like a great small publisher. Best of luck! Thanks Leslie! Month9Books is wonderful, I'm so glad I signed with them.